Bring to a boil and cook for 1-2 minutes or until the sauce thickens. Pour the sauce over the chicken and toss. 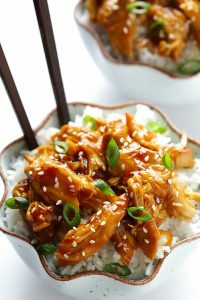 We love chicken teriyaki over white or brown rice but you can also put it into sandwiches, pitas, over potato etc etc It’s so yummy!